I'm in love with a song right now called Mr. Blue. We all know what it's like to have really down days so it inspired me to make a little something for people to smile. and then brought them back outside. so to spot them would be a lovely surprise. My favorite line of the song is, "Mr. Blue, don't hold your head so low that you can't see the sky"
Well I made sure to fill some cracks in the sidewalk with the rocks for people who feel so low they just can't look up. So Mr. Blue, this one's for you. Your blog is so inspiring! 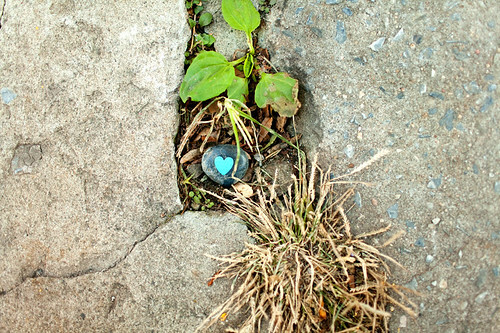 I love this, and I wish I lived closer to you so I could go out and look for these rocks. Thank you for bringing some sunshine in my day. Another lovely idea :-) You really have a gift! I am one of the people who needed this today. Knowing that you've done this, and seeing your photos, is just as uplifting to me as if I found one of these rocks. Thank you for a really good smile. So lovely! 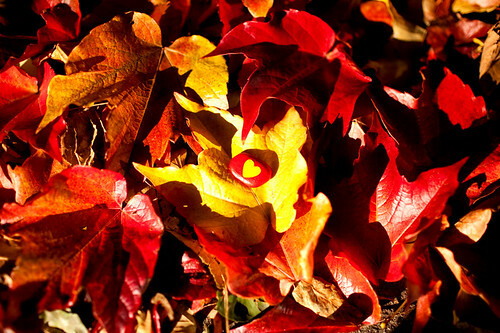 I would love to find one of these on my walk :) Your blog is so inspiring! This made me smile and I wasn't even feeling blue. You are a treasure. amazing. I wish i had your mind. You are so sweet Katie! what a wonderfull idea, you are such a creative person! i could never have gotten such an idea but it just makes you smile when you only look at the photos and i can hardly imagine how surprised i would be if i found one of those! this is the best of all the things. 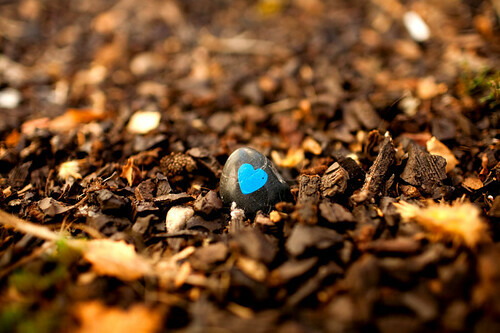 I like the blue hearth!! This is the reason why I love your blog so much. What a marvelous idea. Thank you for sharing! If one can judge you by your blog, you are the most positive person I've ever "met". Wow. Ah, Mr. Blue. A song that's in my iTunes for years now, and still love it. If I find this rocks in the most unexpected area, it will definitely bring smiles. thank you so much for sharing this. i'm one of the people who needed this today. That's so cute! I had a similar idea except I wanted to write inspirational stuff on post-its & put it in public places like boards, bathrooms, etc. I love this idea so very much, how sweet! "Well I made sure to fill some cracks in the sidewalk with the rocks for people who feel so low they just can't look up." Thank you for doing this. :) You sure spread happiness around you. So so so cute. You are sweet and crafty! love it. They look great, lovely idea!!! I hope one day I find a rock like this! Which means your rocks spread, either by passing the idea or passing the stone from place to place! Wow. This is going to bring so much sweet, quiet goodness. My mom passed away a little over a week ago, and just seeing the photos of these rocks touches my heart with hope. Thank you for what you do. ohhh i just downloaded this song two days ago! coincidence! it's so sweet. I'm totally going to do this with my sons tomorrow. We'll leave them around town on our walk. I've always loved that song!!! They are beautiful, and it's a fantastic idea. I want to do this! I love that song! :) I found it a while ago and I love to listen to it when I'm feeling a bit down to cheer myself up. OH my sweet tea, So creative, and adorable. If I found one of these rocks I would be so happy. Totally indescribably awesome. I'm inspired to do these things for the people around me too. I have missed seeing your lovely posts, this one fills that long gap quite lovely-like. Love it! Finding a rock like this would make my day. It's official : you are an angel ! ;) Thank you. Love the post , so creative!!! love this idea. maybe i should make some people smile in my town too! You guys are so sweet, I just want to squeeze you all! @Cathlene Bell- I'm so sorry to hear that your mother recently passed away. I hope you're doing okay. Sending you over a great big internet hug! You are the sweetest thing ever! Awwww! That is sooo cute!! such a cute idea! I wanna do this too! I don't know you, but you're absolutely FABULOUS! I'm a new blogger... and I hope mine can be like yours someday. My room is going to get a lot more colorful, and (I hope you don't mine) I might steal some of your ideas to spread the love. Amazing idea to paint rocks and spill them around.... Genuinely awesome. Also, thanks for introducing the song (I'm 100% positive I've heard it before and liked it back then, even though I can't simply recall when or where). Reminds me a little bit of Lena's songs... or of Crave You by Flight Facilities. They're lovely. It'd make my day to find something like this on any day, but especially on a blue day. Thank you for posting this & for being such an amazing person. I've been "Mrs. Blue" since last night, and this brought a smile to my face. 1. I love that song, too! 2. Such an adorable idea. I hope they brighten many days. I've been pretty blue myself lately, and after reading this I decided I couldn't be the only one in my neighborhood feeling that way, so last night I got a big handful of rocks, painted them up (ladybugs, flowers, magic eight balls...), and I'm going to put the in the parks and commons areas this evening :). Thanks for such a beautiful idea. You inspire me to be a happier, more positive person. such a cute idea! i wish i lived in New York so I could find me a happy little surprise! This is a lovely idea! What kind of paint did you use? You are so amazing! You inspire me to do more stuff like this. I love it all! Keep it up!! I love you posts so much, they make my day! Thank you! a couple of caring friends sent this blog to me today. it was exactly what i needed and i love your attitude and creativity in the ones i peeked at after. thank you for existing! I'm so doing this. 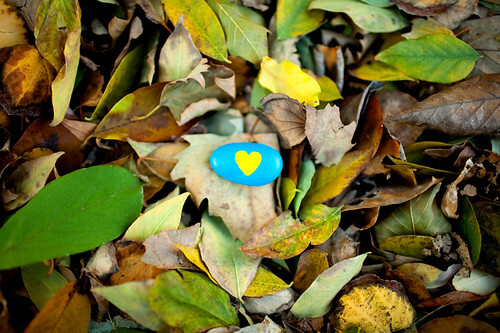 I know that if I ever found one of these rocks it would completely make my day... Now I absolutely HAVE to do this. Thank you for this wonderful idea! I like it a lot! What kind of paint do you use? It looks so bright on the rocks. I love these things you have on your walls. Is this normal paper? And how do you fix it on your wall? I just found your blog via liv lane and this was the post which introduced me to you. I love this, such an awesome thought. i must do this, how lovely for those so blue they can't look up to come across a little pebble of love. Beautiful + well done. hi... i like your mr.blue. nice share. please come to my music site. all those colors. it's just great. I adore the idea of someone walking down the street and stumbling on one of these little beauties! love the song, love this blog, and love the idea! you're so wonderful. i wish i would find one of these rocks! Awe..... this post made me angry!! Why must you always mock me rocks!!! How to take a blue situation and make it positive! I love this idea! I think I may just have to steal it! I think these photos would make a great calendar!! You are such a blessing. Thanks for being so sweet! That is such a beautiful idea. I know it would make me feel wonderful to find one of those on a day when I was feeling low. Featured a link to this post on my blog today! Hope you don't mind:) I love it! This is so cute! And I love your blog! You always make me smile. Thank you! Painted some Rocks today, I know how it is to be so down you don't want to look up, so I loved your idea of blessing anybody hurting out there. I also love the Idea of not knowing who you will give a smile. Thanks katie! yes, 30 years. pretty mad, eh? it's his birthday next month. can't wait! getting him a wooden bike. I love the fact that you took your time to create something special for someone you don't even know - just to brighten up their day. Thank you for doing this. I'll definitely do this myself! Love this idea! Love your Blog! You've got such a happy heart, mind and soul! I just love and adore you tons. My 4 yr old would be so thrilled - I can guarantee you she WOULD find one. And it would MAKE her year!!!! That lil girl loves pretty rocks. And I have never seen any more prettier than yours....I think I know what we are doing this weekend. Thanks! Love it! Great idea! Thank you! ahw this is so cute. And sweet of you to do it! Is it the "Mr. Blue" by Catherine Feeny? I have been in love with that song for a few years. It is really beautiful, and definitely perfect for certain moods. Also, I have been following your blog for a very, very long time now, and I think that you are wonderful. Oh that's a lovely, lovely thing to do! You have cheered up my day more than you'll ever know. There's an invisible big Christmas hug winging its wiggly way to you right now. Love your blog. You are such a creative person. 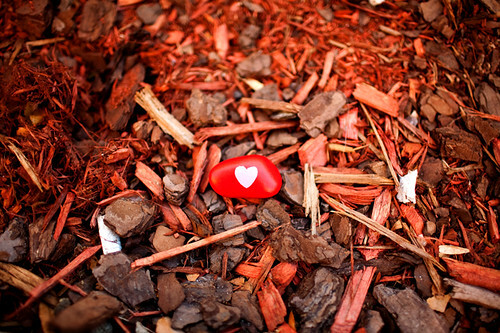 I'm sure the people who found these heart rocks felt special. Amazing pictures. What a brilliant idea. I would be so surprised and happy if I found one of those beautiful stones. This post makes me smile! This is a beautiful idea. :) I think I might just do the same, someday. Love it. You could add some glow in the dark paint for someone to get that special surprise at night. I loved your idea! My friend and I saw your rocks and decided to do this same thing on our college campus. We just finished painting the rocks with hearts, polka dots, and other designs. Thanks for the inspiration. love, love, love this idea. I will definately be doing this!!! What a great idea and it's really inspired me! Love this idea! Thanks for it. I just came here "by accident" and I really, really love your ideas. Especially this one. I really enjoy that someone like you cares so much for others. I like to do the same here, for other people. Thank you very much for making my day! This is such a great idea! 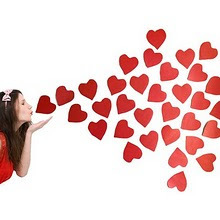 Thank you for sharing some love! I just might have to do this now! I did this today with my kids. Love it! Hi Katie, I made myself some "happy rocks"
absolutely awesome! you're inspired me. Discovered your fantastic blog via pinterest. My artistic teens were inspired by your project here and are going to start drawing hearts, messages and mini works of art to leave around town. Thanks for sharing your creative mind with us. I want to find one like this! Beautiful idea. What a brilliant and thoughtful idea. I have just been given a rock painting kit and was googling ideas when I came across this blogpost. 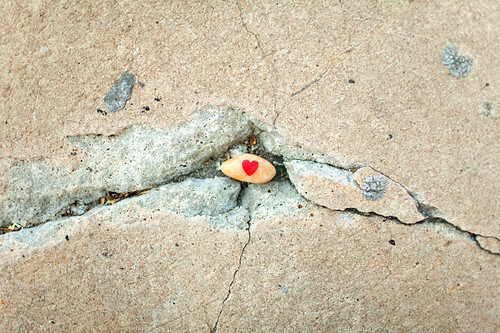 Now I plan to do this on Valentine's Day and leave the rocks around a park for children and dog-walkers to find. Thank you for the inspiration. I love the rocks, but even more I love how you placed them outside for others to find and enjoy! We adapted this idea into Valentines for my third and fifth grade boys' classmates. 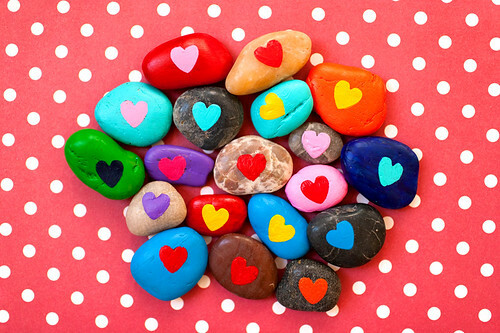 The boys painted the rocks bright colors, added the little hearts and glitter, and wrote business-sized cards that say, "Valentine, you rock!" They loved making them and can't wait to give them out tomorrow. I still love the idea of painting rocks for folks to find outside, so I'm going to encourage the boys to take the extras outside to hide once the threat of snow passes. Another great option would be to deliver a basket of these to a nursing home. I think the residents would love the feel of the rocks and the bright colors. 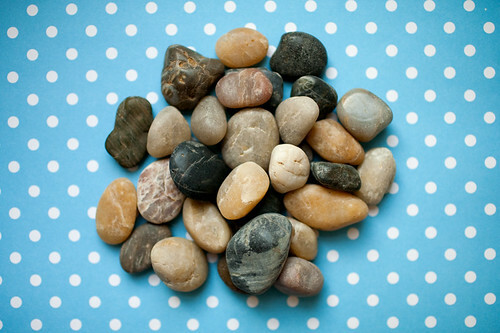 Even those who couldn't hold the rocks might find a reason to smile when they see them on their nightstand.